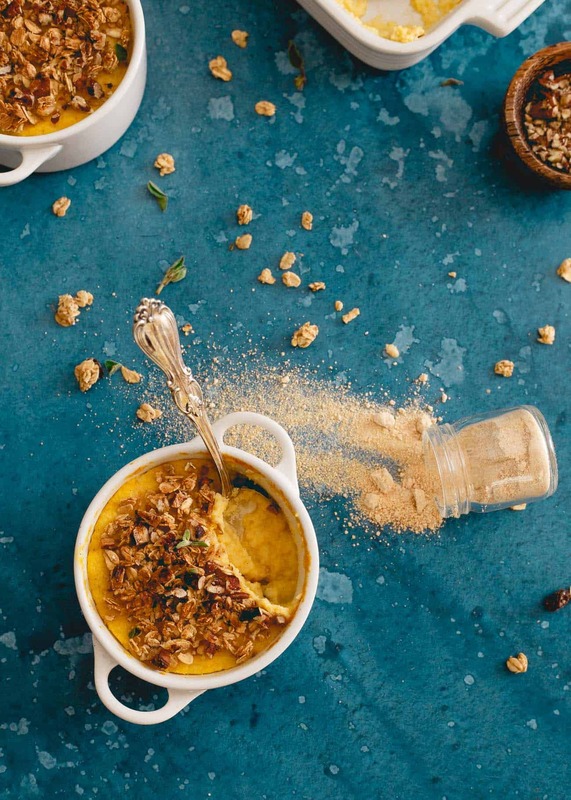 This cauliflower pumpkin mash is made with creamy mascarpone and topped with vanilla granola and pecans. A healthier alternative to sweet potato casserole! We never really did those weird (to me) sweet potato casseroles with the mini marshmallows on top in my family. My great-grandmother, then grandmother and now mom religiously make “torta” (sweet potato pie) every Christmas but the traditional Thanksgiving casserole has never made an appearance on our holiday table. I used to think I was missing out big time by this, kinda like how my mom refused to buy the fun snacks for us as kids (looking at you, Poptarts), being deprived of a side dish studded with marshmallows just seemed cruel. I don’t actually know when I first tasted the classic dish, it might’ve been in college at our epic Thanksgiving dinner in the caf, but the let down was one of the most disappointing situations of my life. It was weirdly (overly) sweet and instead of the marshmallows complementing the sweet potato, it just made the whole situation worse. All those years of built up anticipation, gone with the first forkful. This creamy cauliflower pumpkin mash is my best attempt at remedying that whole sweet potato casserole situation. With mascarpone mixed in and the strong squash flavor mellowed out by the cauliflower, the savory elements of this mash are way more palatable. 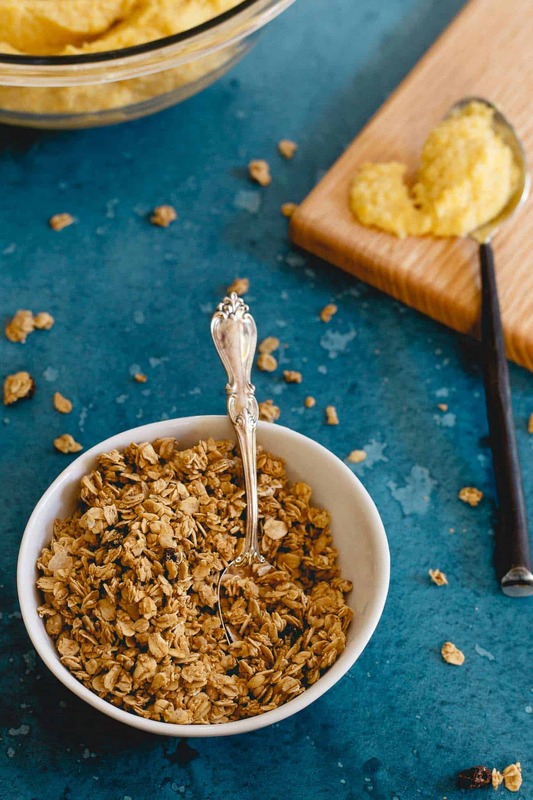 The sweetness comes in the form of just a little maple sugar (<–love that stuff), vanilla bean paste and then of course, the Udi’s vanilla granola topping which not only adds to the sweet and savory flavor balance but, also gives a much needed crunch to the otherwise creamy, smooth dish (another thing sweet potato casserole is missing!). If this casserole/mash/bake/whatever you want to call it isn’t on your holiday table, you’re missing out. Trust me! 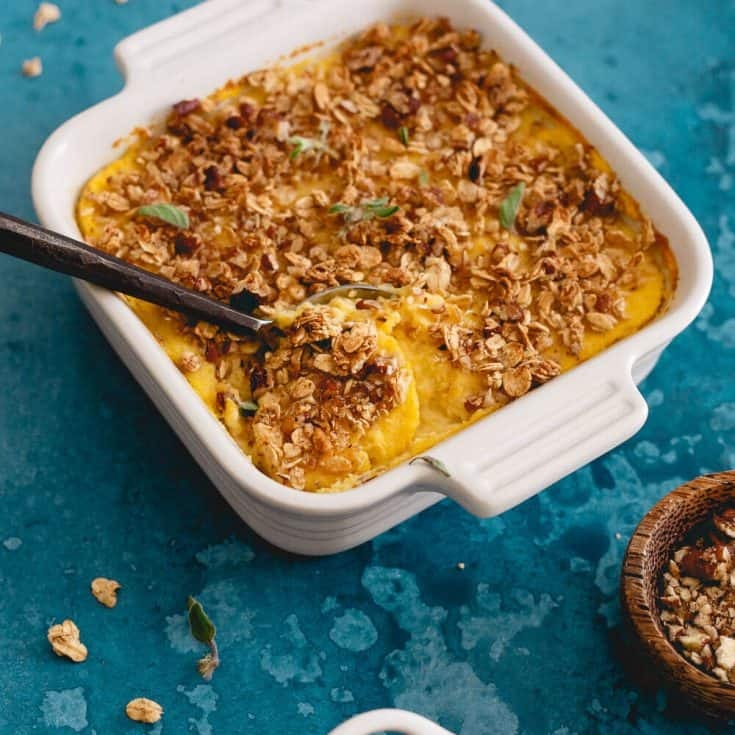 Although, if this butternut squash and cranberry gratin or this maple and roasted garlic squash puree are instead, you’re good. Combine cauliflower, pumpkin, mascarpone, maple sugar, vanilla bean paste, milk, cinnamon and salt in a food processor. Process until smooth. Transfer the mixture into an 8x8 baking dish or smaller ramekins. Smooth the top of the mixture and top with the granola and pecans. 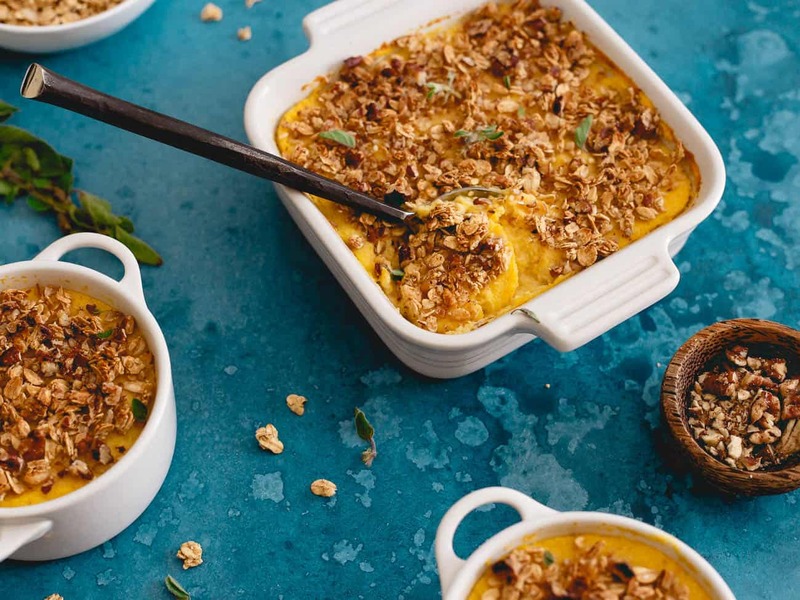 This casserole looks DELSIH!Love this idea of adding cauliflower and using pumpkin in place of sweet potatoes for a less sweet side dish. I used to only eat sweet potato casserole during Thanksgiving and nothing else (wouldn’t even touch the turkey) because it basically tasted like dessert. But I agree, its wayyyy too sweet to be a side dish! Totally with you on the sweet potato casserole! And I should make this one this year! It looks incredible! I like all the ingredients, and I also love the texture of the vegetables. 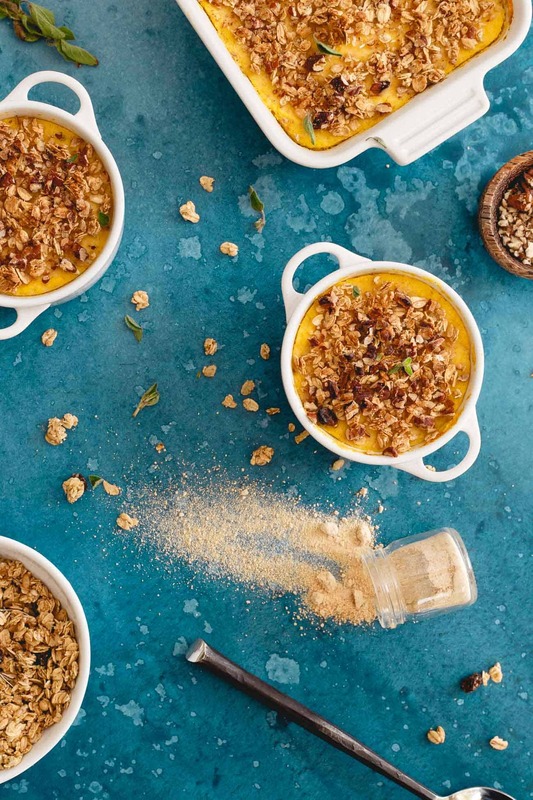 I do believe that I would just chunck into small pieces, the squash and cauliflower add the rest of the ingredients, put the nuts and granola over the top and bake. Casserole to me should not look like pudding. This is awesome – I always find sweet potato dishes to be so sickly sweet but I LOVE sweet potatoes without the marshmallow – was looking for a perfect side dish without all the extra sugar – this is perfect.